Welcome to another Springy Outdoor Wednesday. Thanks to Susan at Southern Daydreamer for organizing us. I've been dying to share these pictures of our trip with you. One of the main reasons we timed our trip to Savannah last week was so we could attend the North of Gaston Street Hidden Gardens Tour. There were 14 gardens in the historic district of Savannah open for viewing. Some of these nice people even invited us in to see their homes. I think we were reminded of a few gardening ideas that can apply to our big yard. #1 Focus on small areas. #2 Repeat colors and plant types rather than using a little of everything. This seems to have a greater impact visually. #3 Use lots of ferns and ivy. Thank you for coming by to visit today. 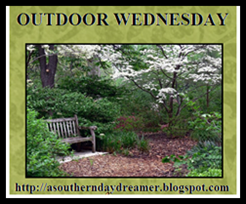 Please go on over and visit the other Outdoor Wednesday participants. We went through Savannah, but didn't stop now i wish we had spent some time there. Every thing was so beautiful and I thank you for the tips, as I have a fairly large too. I love Savannah gardens -- I love Savannah homes too -- Linderhof's garden is small so perhaps that is why I like the Savannah ones so well! I love this city. Thanks for the tips. Happy Earth Day and Happy Outdoor Wednesday! What fun! I wish I could have a garden like one of those. Just beautiful! Thanks for sharing with us. Gorgeous! It's amazing what you can do in a little space. When we went to Savannah last year we didn't get to tour any gardens and I'm really sorry we didn't. Great pictures! I loved the garden tour. Great post! Enjoyed the tips. Hi Stacey, I love the pictures and the tablescape is lovely! I love the gardens. They are very inspiring and thanks for what you have learned from them. It must have been a wonderful trip. Such pretty spaces. I still need to travel to the southeast part of our country...never been. Your Savannah garden pictures are beautiful! The spaces look so restful & relaxing. Oooooh, love the purple transferware, and this picture reminds me I need to pick up some geraniums!! Those pics are so pretty, and I can only imagine what a fun tour that was!!! thanks for sharing! Such pretty gardens. Inspirational, isn't it? Spring. Thanks for sharing all of the pictures with us. I'm so glad you shared these beautiful pictures with us. It looks like a wonderful garden tour. It always amazes me to see how some people can make even tiny yards look gorgeous. How delightful to see such lush and individualistic gardens! Hope I can visit Savannah some day. I do enjoy seeing small gardens, for my yard is really not all that large. I just happen to live on the corner, which gives me more than my neighbors in this cul de sac of garden homes. Yes, ivy and ferns. Two of my favorites. Those dishes look kind of like what I got yesterday at the consignment shop half price. Posted it on my new decorating blog Cozy Little House. Thanks so much for popping in to see me! I just had to check in - blogging gets into our blood, ya know! Ohhhh this is beautiful...I have always wanted to go to Savannah!!!!! I can't believe what a huge impact they put into those tiny gardens! What a great tour! The gardens are just lovely. Thank you so much for sharing them with us. I have not been to Savannah for years. It really makes me want to take an early summer jaunt. Great gardens and tips. You did good! Have a happy Earth Day. I fell in love with Savannah after having read your article, Stancey. Gorgeous photos show in front of my eyes.. I think it could be a perfect wedding place, all the colors and beauty+full scene, my God! I hope you had a Happy Earth Day. I love the picture you took while visiting Savannah. After visiting thei I just had.. to have a bird girl statue. I found a very nice one. I loved her so much. But, she fell over and broke. I really want another one. But, they are not cheap. Maybe someday. The gardens of Savannah are just one of the things that made us fall in love with the city. They are small. But, so romantic! I have been wanting to go to Savannah so bad . The gardens are so pretty. It is finally getting warm here . Beautiful post! Thanks for sharing your trip with us. I have a pretty big yard too and those are great reminders on how to handle it. Oh Sweet Savannah! The pictures are gorgeous! I am so far behind on blogging I will never get caught up! TGIF in just a few hrs! I'm not use to working everyday and I am wore out! Can't wait to see more Savannah pictures! I look forward to using lots of ferns and ivy in Mobile. Was that a gardenia? Gotta have a few of those! Thanks for sharing.